Jose María Escrivá was born in Barbastro, Spain, on January 9, 1902. He had one older sister, Carmen (1899-1957, three younger sisters who died very young, and a younger brother, Santiago (1919-1994). His parents, José and Dolores, brought up their children with a devout Catholic faith. Jose María’s father’s textile business failed in 1915, so the family relocated to Logroño, where José found other work. It was in Logroño that Josemaría sensed his vocation for the first time. After seeing some bare footprints left in the snow by a friar who had walked that way a short time earlier, he felt that God wanted something from him, though he did not know exactly what. He thought that he could more easily discover what it was if he became a priest, so he began to prepare for the priesthood, first in Logroño and later in Saragossa. Following his father’s advice, he also studied for a law degree at the University of Saragossa. His father died in 1924 and Josemaría was left as head of the family. Ordained on March 28, 1925, he began his ministry in a rural parish, and afterwards in Saragossa. In 1927, with the permission of his bishop, Fr. 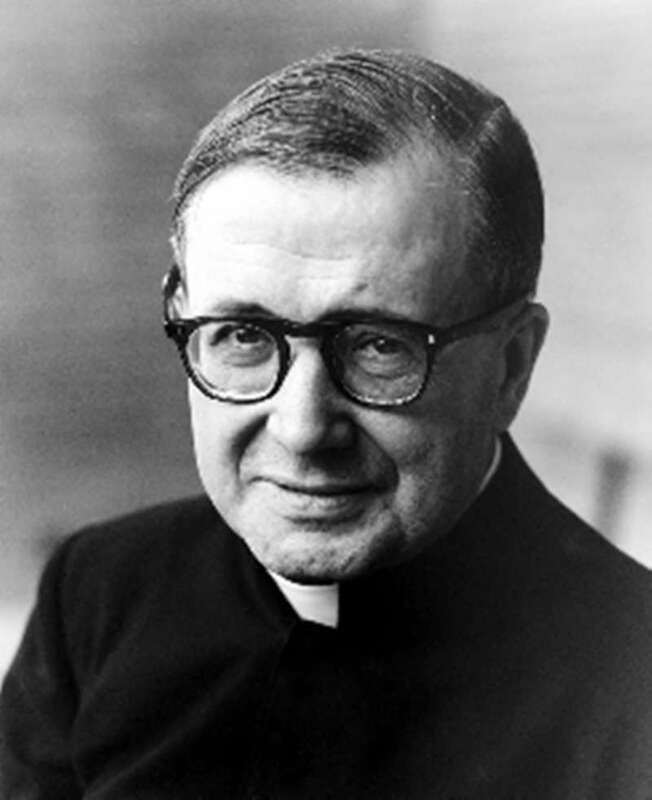 Josemaría moved to Madrid to work on his doctorate in law. There, on October 2, 1928, God showed him clearly the mission he had been hinting to him for several years: Opus Dei. From that day on he worked with all his energies to develop the foundation that God asked of him while he continued to fulfill the various priestly responsibilities he had at that time. These brought him into daily contact with sickness and poverty in the hospitals and the poor districts of Madrid. 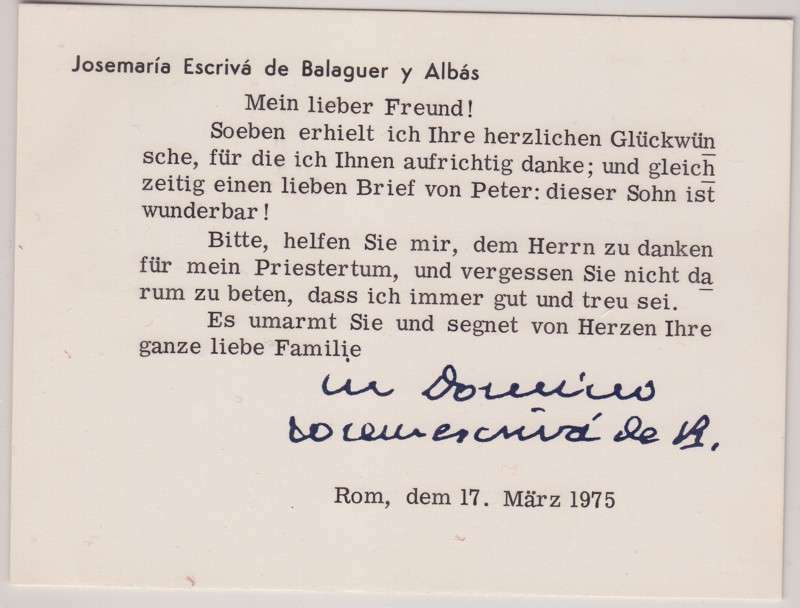 My Dear Friend, I have just received your heartfelt greeting for which I sincerely thank you and at the same time for the dear letter from Peter. That son of yours is wonderful. Please help me to thank the Lord for my own priesthood. And do not forget to pray for me that I may always be good and faithful. Blessings from my heart for you and your entire family. When the civil war broke out in 1936, Jose María was in Madrid. The religious persecution forced him to take refuge in a variety of places. He exercised his priestly ministry in a clandestine fashion until he was finally able to leave Madrid. After escaping across the Pyrenees he took up residence in Burgos, which is in northern Spain. At the end of the war in 1939 he returned to Madrid. In the years that followed he preached many retreats to lay people, priests, and members of religious orders. In the same year, 1939, he completed his doctorate in law. In 1946 he took up residence in Rome. There he obtained a doctorate in theology from the Lateran University and was named consultor to two Vatican Congregations as well as an honorary member of the Pontifical Academy of Theology, and prelate of honor to His Holiness. He followed closely the preparations for the Second Vatican Council and its various sessions (1962-1965), keeping in touch with many of the council fathers. From Rome he frequently went to different countries in Europe, including Britain and Ireland, to spur on the apostolic work of Opus Dei. It was with the same objective that, between 1970 and 1975, he made long trips to Mexico, Spain, Portugal, South America, and Guatemala, holding catechetical gatherings which large numbers of men and women attended. On May 17, 1992, Pope John Paul II beatified Jose María Escrivá. He proclaimed him a saint ten years later, on October 6, 2002, in St. Peter’s Square, in Rome, before a great multitude. In his homily on that occasion, the Pope said: Following in his footsteps, spread in society the awareness that we are called to holiness, without distinction of race, class, culture or age. The Glossary of Papal Artifacts contains a short explanation of Opus Dei. Papal Artifacts gratefully acknowledges www.opusdei.us for their biographical help in preparing this information.